1. 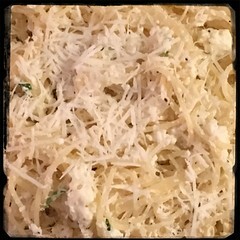 Simply make a savory Ricotta Mixture while you’re cooking your spaghetti or spaghettini. 2. Once the pasta has about 5 minutes left to be done, remove a ladle or two of pasta water an put into a large pan. 3. Add the ricotta mixture and allow to cook for a few minutes, mixing well so that the ricotta stays loose. 4. Toss the pasta with the cooked ricotta mixture and serve hot!